Frozen Shoulder and Yoga: How to Work With It? Transcript Below Of: Frozen Shoulder and Yoga: How to Work With It? I’m going to do a question of the month. 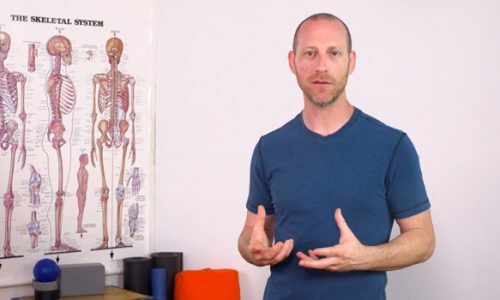 Before I get started with this month’s topic of frozen shoulder and yoga, I want to make sure all of you know that I’ve got some great online courses and workshops coming out on YogAnatomy.com. If you haven’t already, go over to yoganatomy.com and get signed up on the newsletter, so you hear about it. Well, as usual, it’s more complicated than we want it to be. Frozen shoulder is one of those things that, depending of the phase or stage of frozen shoulder that the student is in, you might do different things or different things might be acceptable at different times. First, make sure you have a good assessment and that the assessment reveals that it is a frozen shoulder. There are occasions where a torn rotator cuff, could create similar symptoms. The differentiator in a very simplistic form is, in a torn rotator cuff, passively being moved is usually not painful, whereas in a frozen shoulder, even somebody else moving your arm for you is often painful. That’s one test. So, make sure it’s assessed correctly. Assuming it is a frozen shoulder, the frozen shoulders are often going to happen in three phases. One is the freezing phase, one is the frozen phase, and then one is the thawing phase. When it’s in that freezing phase and it’s starting to tighten and the pain is starting to increase, the last thing you want to do, well, the last thing you want to do in any of those phases, is increase the pain, especially after doing any movement. That is your fundamental, basic test for any posture that you’re considering having the student do, or if you are somebody with frozen shoulder, that you’re thinking of doing. You always want to test out one thing and then see how your body reacts to it, so it’s no different here. That’s true of any injury and any modification that you’re thinking might be appropriate. So, having said that, in the freezing stage, do smaller movements and I would suggest, probably not weight-bearing. That might be true of freezing and frozen itself. It’s better to do things like arm hanging or maybe just barely playing with the edges of ranges of motion. Once again, we’re not wanting to push it so far that the body responds by tightening or creating more pain following that activity. That could be anywhere from immediately after to 24 hours later. Now, in the thawing stage, there’s a little bit more freedom and range of motion is typically starting to increase again. So, pushing it a little bit further, playing with that edge a little bit more is going to be more appropriate. I don’t have any specific posture that somebody should do or should not do. It’s going to typically be modifying the existing ones. You know, if it’s warrior, maybe the arm can’t go up all the way. Maybe the arm has to sit lower, or the hand goes on the waist. You can feel free to make it up, just make sure you’re coming from the perspective of testing to make sure this is okay. Alright? There is also an article on the website that was written by a friend named Mike Monroe, who is a physical therapist and he wrote specifically on frozen shoulder and yoga. I don’t recall him giving any specific postures that you should or shouldn’t do, because that should be done on a case by case basis anyway, but check out that article. You can always go to the search bar on the articles page and type in frozen shoulder and yoga and then you’ll find that article. Alright Shirley, I hope that helped. Should I Do Full Expression Of A Pose On One Side If I Can’t Do It On The Other Side? 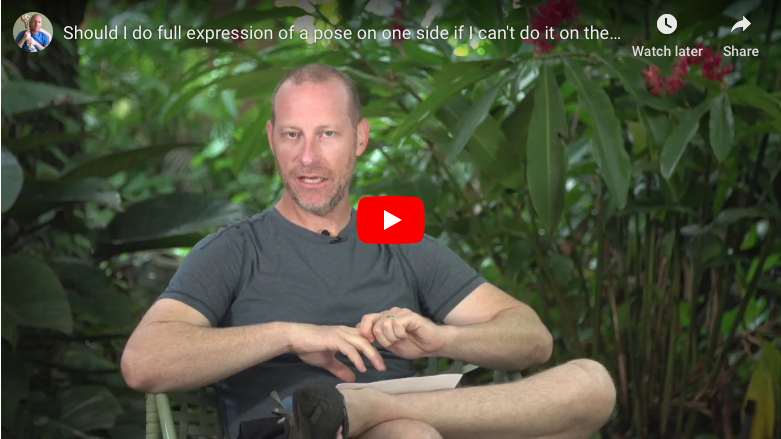 David explains why you should do both sides of a posture even if one side is more flexible than the other. He also shares a tip for binding ardha baddha padmottanasana. What Causes Abdominal Cramps During Primary Series? 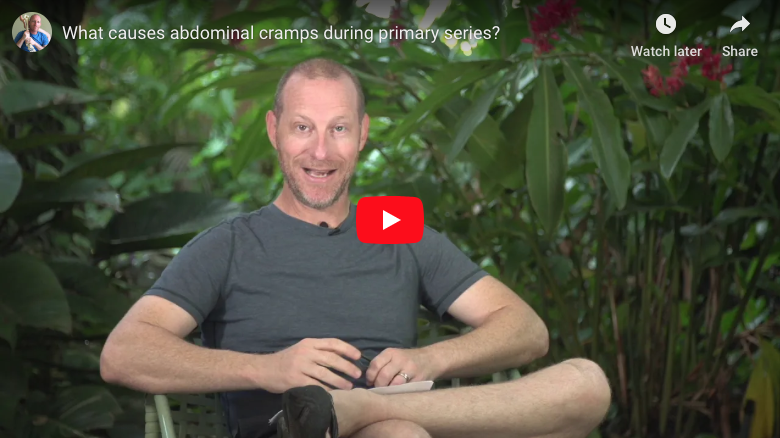 David answers the question: What causes abdominal cramps during primary series? 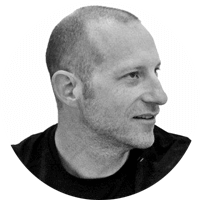 He explains why repeated forward bending and dehydration could both contribute to cramps. How Do I Self-treat Sit Bone Pain and Obturator Internus? 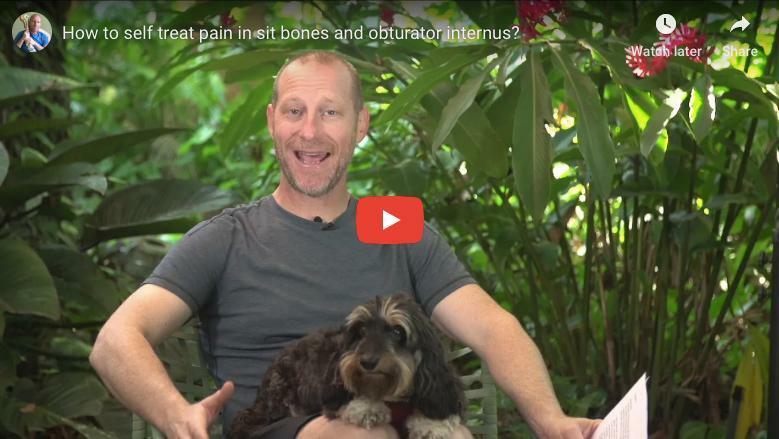 David answers the question: How do I self-treat sit bone pain and obturator internus? He explains that sit bone pain can originate from many different sources. So, You want to do a handstand? This website is simply about delivering yoga anatomy to the yoga community in a simple and understandable way. It has always been about you, the reader, understanding the complexity and diversity of our own humanness as well as our anatomy. Need 20 hours of anatomy for your TT?